Honored as faithful to you with a peaceful end. On the twelfth Theophanes perished and departed from life. Saint Theophanes the Confessor was born in 759 at Constantinople into a pious and renowned family. His father Isaac was a relative of the Emperor Constantine V Copronymos (740–775). Three years after Theophanes was born, his father died, leaving him and his mother Theodote under the care of the emperor himself. Theophanes grew up at the court and became a dignitary under the emperor Leo IV the Khazar (775-780). His position obliged him to enter into marriage, which he did at the age of twelve, but he persuaded his bride to live with him in virginity due to his love for the monastic way of life. 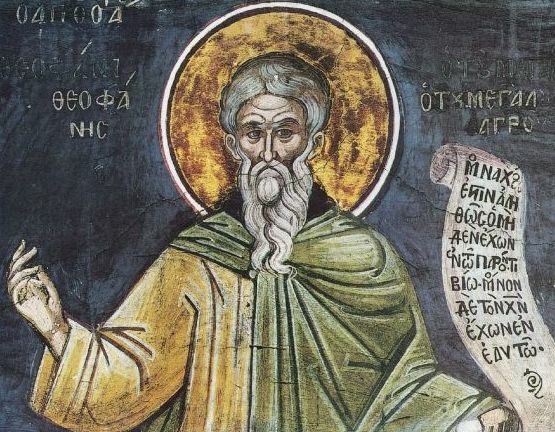 In 799, after the death of his father-in-law, Theophanes and his wife separated with mutual consent to embrace the monastic life after traveling to various monasteries. 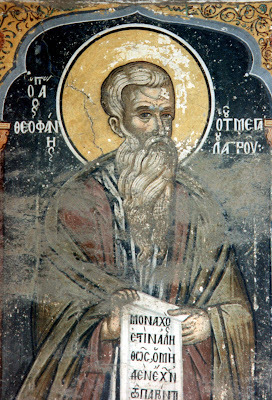 Theophanes met the Elder Gregory Stratigios, who predicted to Theophanes’ wife that her husband would earn the crown of martyrdom. She chose a convent on an island near Constantinople, while he entered the Polychronios Monastery, located on Mount Sigriane, near Cyzicus on the Asian side of the Sea of Marmara. Later, he built a monastery on his own lands on the island of Kalonymos in the Sea of Marmara. With the blessing of his Elder, Theophanes founded the Kalonymon Monastery and secluded himself in his cell, transcribing books. Theophanes attained a high degree of skill in this occupation. Later, Saint Theophanes founded another monastery on Mount Sygriane, at a place called the Megalos Agros or Great Field, and became its abbot. He participated in all the work of the monastery, and was an example to all in his love for labor and ascetical struggle. He received from the Lord the gift of wonderworking, healing the sick and casting out demons. The Seventh Ecumenical Synod met in Nicaea in 787, which condemned the heresy of Iconoclasm. Saint Theophanes was also invited to the Synod. He arrived dressed in his tattered garments, but he revealed his wisdom in affirming the veneration of the holy icons. At the age of fifty, Saint Theophanes fell grievously ill and he suffered terribly until the day he died. Even on his deathbed, the Saint continued to work. Among his works he wrote his Chronicle, a history of the Christian Church covering the years 285-813. This work has remained an invaluable source for the history of the Church. During the reign of the emperor Leo the Armenian (813-820), when the Saint was advanced in age, the Iconoclast heresy returned. They demanded that Saint Theophanes accept the heresy, but he firmly refused. His Great Field Monastery was put to the torch. Theophanes was cast into prison and for two years suffered cruel treatment. After his release, he was banished to Samothrace in 818, where overwhelmed with afflictions, he lived only seventeen days. He is credited with many miracles that occurred after his death. After the death of the impious emperor Leo the Armenian, the Great Field Monastery was restored and the relics of the holy confessor were transferred there. By thy virtuous life, O venerable Theophanes, thou didst serve God Who was made manifest in the flesh for our sake. For thou didst renounce all fleeting possessions, and add the prizes of confession to thine ascetical crowns. By means of both thou didst illumine the ends of the world. O Theophanes, by thy godly life thou didst become a chosen vessel and servant of God the Word, and of His life creating manifestation on earth. Thou didst reverently honour the icon of Christ, and thereby suffer afflictions at the hands of the ungodly. Hence God has granted thee grace and eternal life.